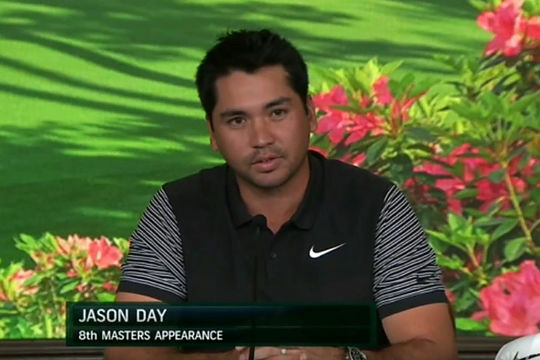 (Augusta, GA:) Top world ranked Aussie Jason Day admits he gets chills dreaming of being fitted with a Masters green jacket. Day has come close twice in his seven appearances at Augusta National to winning the most sought after item of clothing in all of golf. The first was on his Masters debut in 2011 where he remarkably finished second only to see South African Charl Schwartzel birdie his closing four holes to claim victory. Two years later, Day was leading the 2013 Masters with three holes to play only for fellow Australian Adam Scott to emerge as the first Australian to win the Masters. And now after his play-off victory earlier this year at the Farmers Insurance Open, Day cannot be discounted in becoming the second Australian-born player in five years to win at Augusta National. “In looking back from 2011, having good results and in 2013, and still having decent results in there between, this is a tournament that I always focused to try and win every single year, and I’m striving towards hopefully one day slipping that Green Jacket on and being able to call myself a Masters champion,” said Day. Day is among just a small contingent of four Australians including Scott, Marc Leishman and Cameron Smith, contesting the year’s first Major. They join a long list of Aussies who have teed it up at the Masters since Jim Ferrier became the first at Augusta National in 1940. And it prompted Day to be asked by the Australian-born moderator of his interview what it had been like for Day growing-up in Australia watching TV coverage of the Masters. “It is big event for Australians watching the Masters on TV because I think the biggest thing is that we have come so close so many times beforehand, and then obviously with Adam Scott winning, it just made everything so much more special,” he said. And Day spoke of his decison to have good friend, Rika Batibasaga on the bag with Rika, who was on the bag when Day won at Torrey Pines but who will be caddying at Augusta for the first occasion. After long-time coach, Colin Swanton stepped down as caddy, Day has alternated the caddying duties between Batibasaga and Luke Reardon. “This week we won’t go over the numbers because I know how thorough Colin is with being here,” said Day, who retained Swatton as his coach and has him at Augusta National this week as well.